Amy Howlett serves up a stunning spin on an ice cream sandwich, with pistachio-layered filo pastry encasing a richly spiced ice cream. The dish is served with simple, spiced poached peaches for a stunning summer dessert packed with Middle Eastern flavours. Sweet, ripe peaches are a quintessential summer fruit and absolutely sing of the season, so I wanted to create a dish to truly celebrate them. Ice cream is also a perfect image of summer, so as an ice cream lover I wanted to incorporate that. In an early season of Masterchef Australia (of which I am an avid fan! ), a contestant made ‘Frozen Baklava’ in a Middle Eastern invention test – fragrant pistachio ice cream sandwiched with layers of filo. I loved the concept so wanted to try designing my own version. Peaches and pistachios go so wonderfully together. 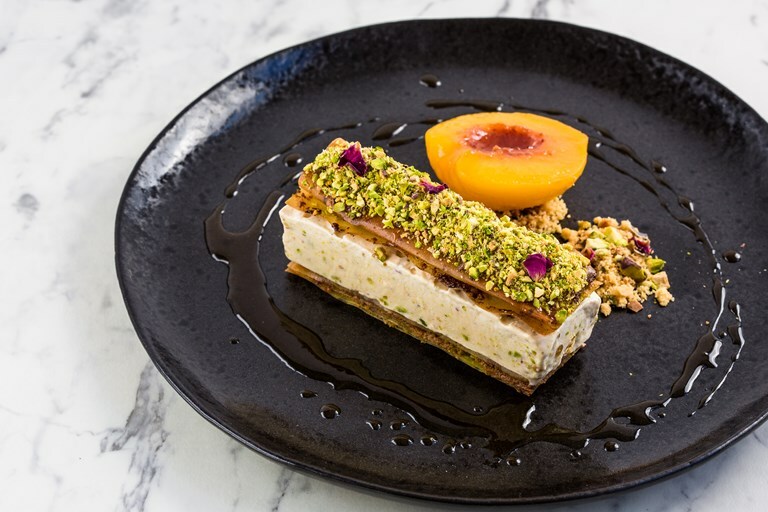 The fragrant Middle Eastern spices really accentuate the natural perfume of the peaches and bring them to life, the ice cream is smooth and delicate, and the crunchy pistachio filo along with the rose petal crumb add texture to complete the dish. Do not be intimidated by the long list of ingredients and steps – the steps themselves are very easy to follow, and the result will truly impress.